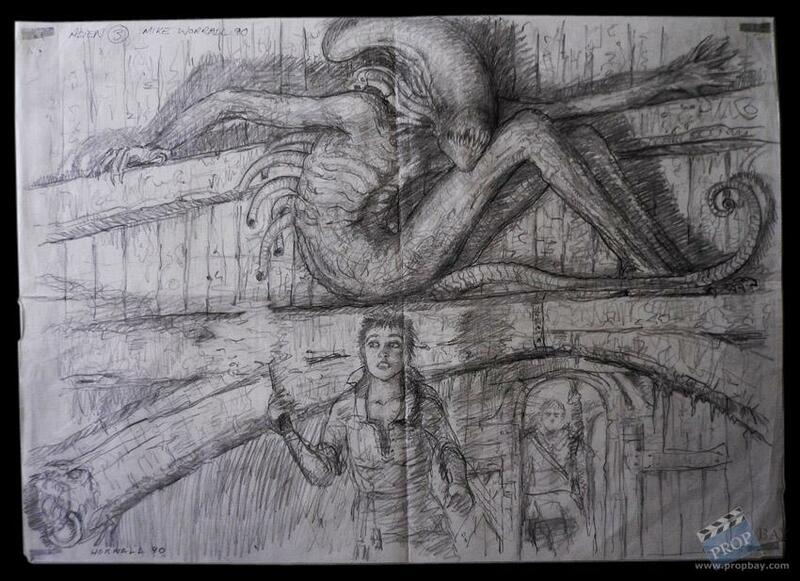 Presented here is an original ALIEN 3 pre-production drawing by Mike Worrall, depicting Ripley entering the Alien's lair on Fiorina 161. The large black and white image was drawn using pencils and charcoal on a thin sheet of paper that was later folded in four. Mike Worrall, born in 1942 in the UK, is an internationally acclaimed painter and fine artist fascinated by the subconscious. Dreams are an important source of inspiration for his work. Just before ALIEN 3 he had worked with director Vincent Ward on another film, "The Navigator - A Medieval Odyssey". He currently resides in Australia. 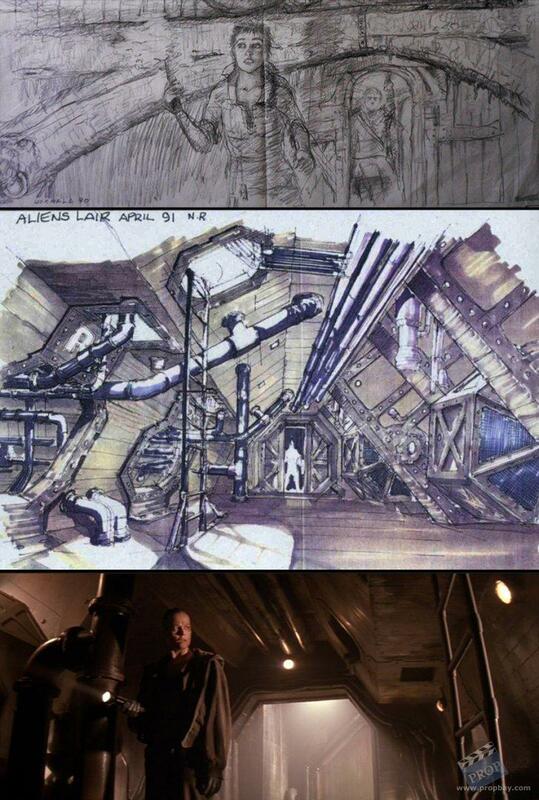 This image was drawn in 1990, in the early stages of pre-production of ALIEN 3, when Vincent Ward was still the director of the film. His vision of Ripley's third confrontation with the Alien involved a wooden planet as main location. The monks that inhabited that wooden planet/monastery survived Ward's script and finally ended on screen as bald prisoners wearing medieval robes… The Alien itself, seen as a dragon in the eyes of Ward's monks, kept a "Beast of the Apocalypse" vibe in Fincher's film, at least for one of Fiorina 161 inmates. The image depicts Ripley as she enters the Alien's wooden lair. Ripley, not bald yet but already wearing a short haircut, holds a candle that helps her see her path. The Alien is hidden in the ceiling, just above her. One of the Alien's "back pipes" seems to be gently blowing on the candle, an effect that catches Ripley's attention (look at her eyes). All these ideas were incorporated in a way or another in Fincher's film. When Ripley enters the Alien's lair, she just has a torch (modern version of a candle) in hand and the Alien is hidden just above her in the ceiling. Prisoners are using candles in the scene where the adult Alien kills for the first time. In that scene the presence of the Alien is revealed to the audience when it blows one of the candles used by the prisoners to mark their path in the dark corridors of Fiorina 161 (images 4, 5 et 6). The drawing presented here isn't part of any of the ALIEN 3 DVD image galleries but featured in a very interesting EMPIRE online magazine article devoted to Vincent Ward's lost vision of ALIEN 3 (image 7). Other examples of Vincent Ward's work on ALIEN 3 can be found in the "Hollywood SFX exhibition" catalog released in Japan in the mid nineties (image 8). The drawing is in very good condition, considering its age and fragile nature. Added: 02-09-2014 - Viewed: 2010 times.